Stir-fries are a popular weekday meal at my house. I try to keep things interesting by mixing up my sauces. 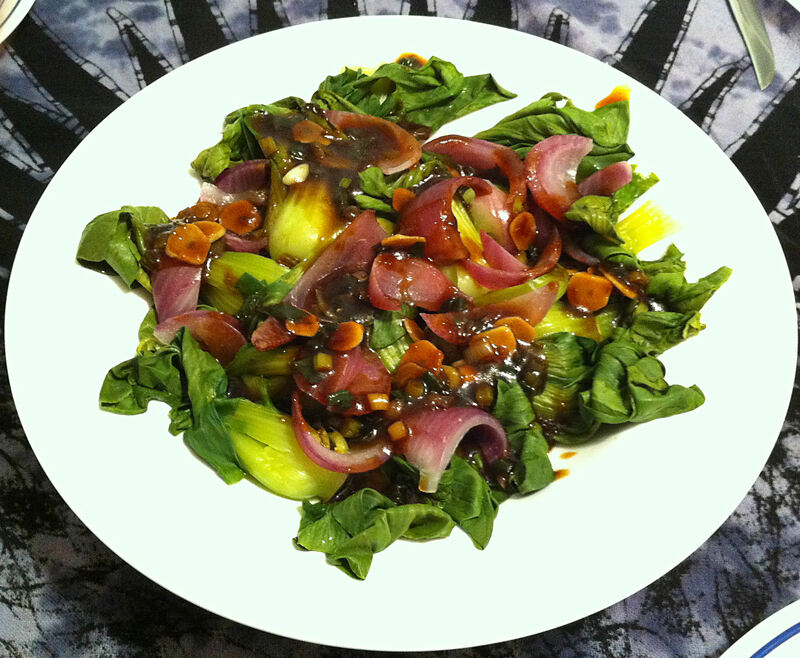 From the basic Chinese sauces, you can blend new combinations every time you make a dish. I am making a Sichuan flavored tri-tip for Sunday’s dinner. All that meat needs some vegetables to go with it. I saw some tiny baby Shanghai bok choi in the market and I thought that they would just fit the bill. My brother-in-law Dee is coming for another of his innumerable medical appointments at the VA. He is getting tired of the biscuits and gravy that I have been serving the last two times he came. He has requested wonton soup. In addition to my main dishes of japchae and bulgogi I made several Korean vegetable sides. I am new to Korean food, so I made this pretty closely to the original recipe. I used small white bok choy, as opposed the green Shanghai bok choy that she used. I am making a Chinese roast pork for Sunday. A vegetable stir-fry is a necessary compliment to a meat heavy dish. Going to Lion Market, I finally decided on baby bok choi and to add variety chive stem. Eilene has come down with another cold—I do not know what it has been about this year that we keep getting sick. Jan suggested that I make her chicken soup. A favorite of hers is chicken udon. The first dish I created on my own—rather than following a recipe—was a soup that Miriam called “Papa’s Fine Soup.” Some powdered lemon grass, chicken, snow peas, green onion, and udon noodles. While this soup has changed over time, it has been a comfort food in our house for almost 30 years. I made ham steak the other day and, after the meal, I had half a pound of ham left. By itself it was not enough to feed three people, but with some creativity I could make a meal of it. Stretch the meat with some vegetables—add an interesting sauce and some rice—and you have something new and different. With the kid’s on the Atkins diet I have to make more vegetable dishes and less dishes that use starch. To go with my char siu pork, I decided that steamed bok choy would be a good Chinese addition. This dish has minimal prep work and a quick sauce. 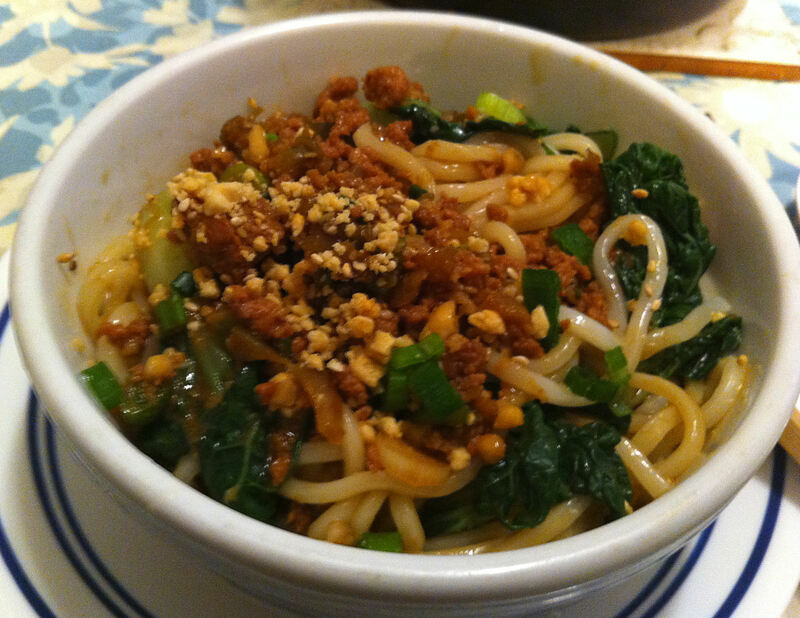 Dàn dàn miàn (担担面; “peddler’s noodles”) are boiled noodles with a spicy sesame/peanut sauce poured over them. The story goes that lunch peddler’s would carry a dàn dàn—a shoulder pole with a bucket on either end—with the cooked noodles in one bucket and the spicy sauce in the other. When you bought your lunch you were expected to provide your own bowl and the seller would put in some noodles and splash some of the sauce over them.